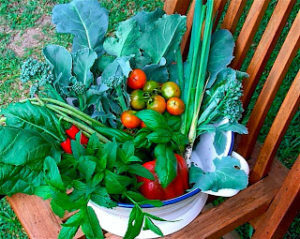 Few gardeners make enough compost for their needs. 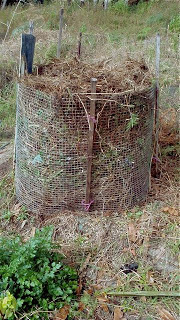 HOT COMPOSTING is an easy way of producing a lot of compost in a short space of time. Most of the ways we make compost is termed COLD COMPOSTING (see previous blog) that is; slowly adding to the heap over time and raking out the decomposed material from the bottom when it is cooked. 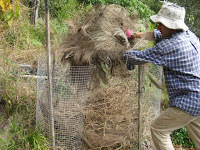 With HOT COMPOSTING the heap is made in one go, left alone to decompose, and then the whole heap is ready to use in a relatively short space of time. 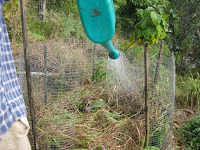 Finished compost faster than COLD which can be quite slow. Jenny and Penny on quality control duties! DID YOU KNOW? * I love it when you find out things like this. 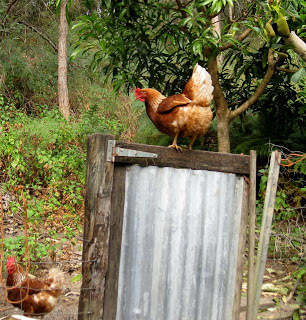 COLD and HOT composting employ different bacteria!! 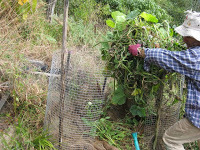 A HOT compost heap will have a lot more air in it and they use oxygen loving bacteria to break down the heap so the nitrogen (essential plant food) is retained in the heap. This is not the case with a COLD heap which has less air in it and employs nitrogen loving bacteria, from the material in the heap, to help it break down- essentially you end up with compost that is more of a ‘soil conditioner’ than a plant food. HOW TO MAKE HOT COMPOST: Come with me to Dave’s place and see how he does it. 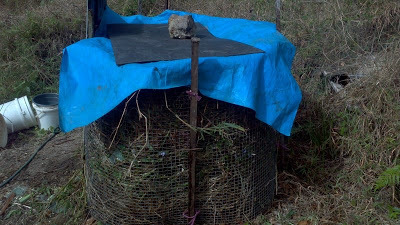 Dave lives on 5 acres with a large re – forested area, vegetable garden, chickens and ducks – so he always has a lot of material for making simple compost heaps like these. TOP TIP: Make your HOT COMPOST in a spot where you want to have a new garden bed – then just rake it out, when it is ready, and PLANT – bingo! 1. Make a simple frame with some chicken wire and pickets. You can also use wooden pallets/straw bales/old bits of corrugated iron etc. It just needs to be big enough to generate heat. Put on your best hat. 2. If you have looked at the previous blogs for making a NO-DIG garden and COMPOSTING you will see that we are going to use exactly the same ‘lasagne’ methods that we used in those-layering CARBON with NITROGEN about 15:1. 3. Start with a good layer of dry/CARBON material – straw/shredded paper/dry leaves/cardboard/egg boxes/wood shavings/dry prunings etc. 5. It’s important to water well between each layer. Here Dave is making sure the composting process will be activated quickly by adding diluted urine – a valuable source of nitrogen that we just flush away. Not so long ago this was all returned to the land – it still is in many countries. 6. 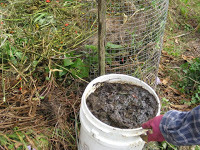 There are other compost activators like COMFREY. This is a deep-rooted plant that mines nutrients and helps to speed up decomposition. 7. Any kind of animal manures are good in not too large quantities and better used as a ‘slurry’ – watered down. 8. You just keep layering until the heap is complete. Make sure you water it well and then cover it. You need to keep heavy rain out and the heat in. What this may lack in looks will make up for fattest eggplants and greenest lettuces. I loved your description of the bushwalk and look forward to casually slipping "a charm of finches" into a conversation. Re the hot compost, I have had little experience with these but have heard it said that the minimum size to generate sufficient heat is one metre cubed.